S I G N & D I G I T A L G R A P H I C S • October 2014 • 45 products using UV ink technology for business to consumer will grow. Also, short-term outdoor signage like yard signs and the display market such as trade shows and events will continue to expand as the economy and businesses expand. In addition we will see the commercial printers and prepress markets rapidly adopting wide-format printing to help grow their businesses. Brian Phipps Vice President and General Manager Mutoh America Inc. While wall graphics and murals get a lot of attention these days, we see an increase in the demand for more high- resolution backlit prints and digital flex- face due to expansion of the electrical sign market. Fabrizio Soto General Manager Seiko Instruments U.S.A., Inc. The proofing and prototyping mar- kets continue to grow each year. Today, customers are seeking to produce sam- ples that look exactly like the finished product, quickly and cost-effectively. Roland's advanced UV-LED and eco- solvent printer/cutters offer a wide vari- ety of package proofing and prototyping applications. 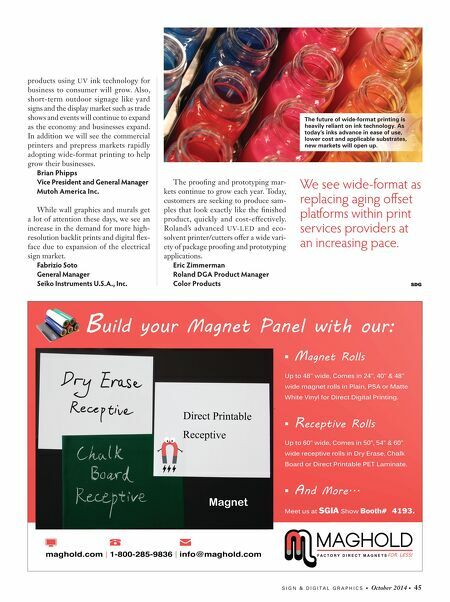 Eric Zimmerman Roland DGA Product Manager Color Products SDG We see wide-format as replacing aging offset plaorms within print services providers at an increasing pace. 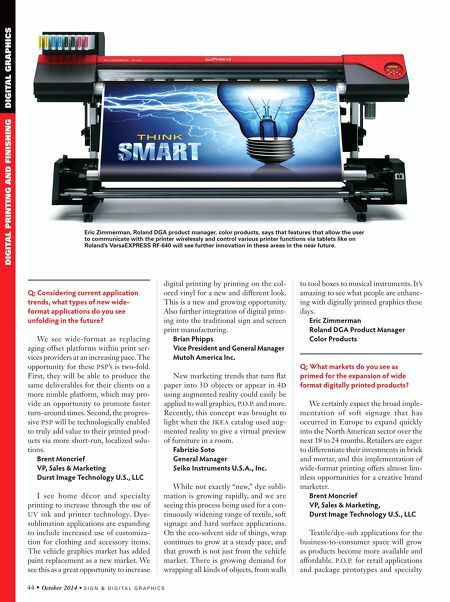 The future of wide-format printing is heavily reliant on ink technology. As today's inks advance in ease of use, lower cost and applicable substrates, new markets will open up.